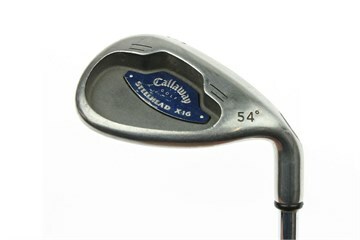 The Steelhead X-16 irons have a wider topline than the their predecessors - the Callaway X-14s. VFT Technology allows Callaway's designers to adjust the thickness and raise or lower the centre of gravity for optimum trajectory with each iron. Higher launch angle in the long irons and better control and increased backspin in the short irons and wedges. 'Notch' weighting system which moves weight to the perimeter - the result is a club which not only plays easily - but looks like it plays easily. I could never quite believe I needed a wedge between a pitching wedge and sand wedge, but if you think about it there is a 15 yard gap between each of your other clubs but 30 yards between pitch and sand wedge. When aiming for the pin thats a huge difference. This club filled that gap and has made my approach shots so much more accurate. Its a confidence thing as well. As my golfing buddy said last night "you`re on a hot streak". I didn`t tell him why! The selection of wedge is quite significant because it could improve your score further when you choose the right one for you. To maintain the consistency of iron swing, I think it's the best way to select wedge of which the specification and character are as similar as possible to the irons. If you use callaway X-series irons, this x-16 wedge is the right one for you, especially for those who use graphite shafts. It gives you the same feeling with the other irons and the balance of swing weight. Much great feel as well when the head contacts ball.